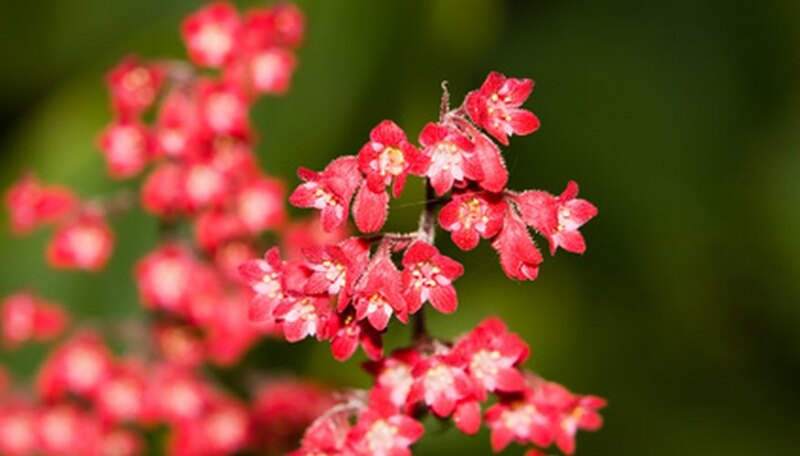 Heuchera, also called "Fireworks" coral bells, are perennial, ornamental flowers that bloom with an explosive display of flowers. They are bright, attention-grabbing facets of any landscaping or garden area, and they grow best in full sun to partial shade, according to Greenhouse Product News (gpnmag.com). While this species of coral bells is very popular, it can fall victim to a number of types of Heuchera disease. Knowing how to spot problems and deal with them effectively and efficiently will help you keep your Heuchera blooming for years to come. Heuchera tend to develop one or more of three main types of disease. They are susceptible to mold and mildews, particularly when they spend part of the day in the shade. There are also several forms of fungal infections that can cause serious problems. Finally, insect infections can also damage or destroy your Heuchera if allowed to progress unchecked. There are some pretty clear signs of trouble with Heuchera that will help you spot and target health issues as quickly as possible. Discoloration of leaves or petals is a good, easy-to-spot sign of trouble. So are wilted leaves when the plant has been getting plenty of water. Spotting, dead spots or holes in the leaves are also indicative of a problem. Leaf spots tend to indicate a fungal infection of some sort. Left unchecked, these brown, yellow or black spots will expand in size and eventually start to rot away in the center. They may or may not cause the leaves to fall. This means your Heuchera has a leaf-spot disease. Molds and mildews, on the other hand, cause leaves, stems and flowers to darken. They will turn black and may get mushy and slimy. If the plant appears to be coated rather than sliding away into mush, then you probably have powdery mildew instead of another mildew infection. Finally, wilting in the presence of plenty of water usually indicates root rot. This is a serious disease and can cost you your Heuchera if you do not act immediately. If you are dealing with a leaf-spot infection or a mold and mildew infection, then sterile pruning is the answer. Use clippers that you rub down with rubbing alcohol in between each snip to remove all affected foliage and dispose of it in a sealed plastic bag. Remove plant debris from underneath the plant as well. Monitor your plants and remove any additional infected leaves. This should get the infection under control. If not, you can use a fungicide to amplify your efforts. Root rot, on the other hand, can be a much bigger problem. Make sure that the plants are well drained and not over-watered. Sometimes you may be able to halt the progress of the disease if you can water minimally to starve the fungus off the roots. Soil fumigation may also be an option, but consult a local expert since this is not legal in all areas of the country. At worst, remove the plant entirely before it affects other plants. The best way to deal with Heuchera disease is to prevent it entirely. Water your plants in the early morning, using a drip hose to prevent leaves and flowers from getting soaked. Make sure that the plants are getting plenty of light and have good air circulation. Finally, only water when necessary. Bogging the ground down will only create an ideal condition for root rot and will not make your flowers brighter or happier.